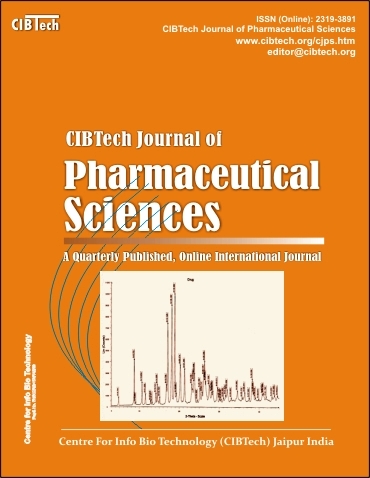 CIBTech Journal of Pharmaceutical Sciences (CJPS) is an open access online international journal that provides online publication of original research work, review, and views on all areas of Pharmaceutical sciences. The Journal (CJPS) is being published by Centre for Info Bio Technology (CIBTech) (Regd. No. SH/311R/2-16AP/42/09) with an objective to promote speedy publication of research work fulfilling the general criteria of significance and scientific excellence. All articles published in CJPS are rigorously peer-reviewed. The Journal is published quarterly (four numbers per year) by the end of March, June, September and December. Aim and Scope of the Journal: The aim of the Journal is to provide a platform for the researchers and academicians throughout the world to speedily publish, share and discuss various new findings and developments in the areas of Pharmaceutical Sciences. The article can be from branches and aspects such as Chemi-informatics, Pharmacology, Pharmacy, Pharmaceutical Chemistry, Pharmaceutical Engineering, Pharmaceutical Biotechnology, Pharmaceutics, Pharmacogenomics, Pharmacognosy, Phytopharmaceuticals, Pharmaceutical management, Medicinal Chemistry, Nanopharmaceutics including topics like drug discovery, drug delivery, drug development, biotransformation, clinical trials, gene therapy, quality control and assurance, technical regulatory affairs, neutraceuticals, molecular modeling, nanodevices and so on. General article: Covering current trends in research in Pharmaceutical sciences but may be interesting to general readers outside the field. Case report: It includes medical case reports. Book reviews: On reference books published in any specialized branch of Pharmaceutical sciences.